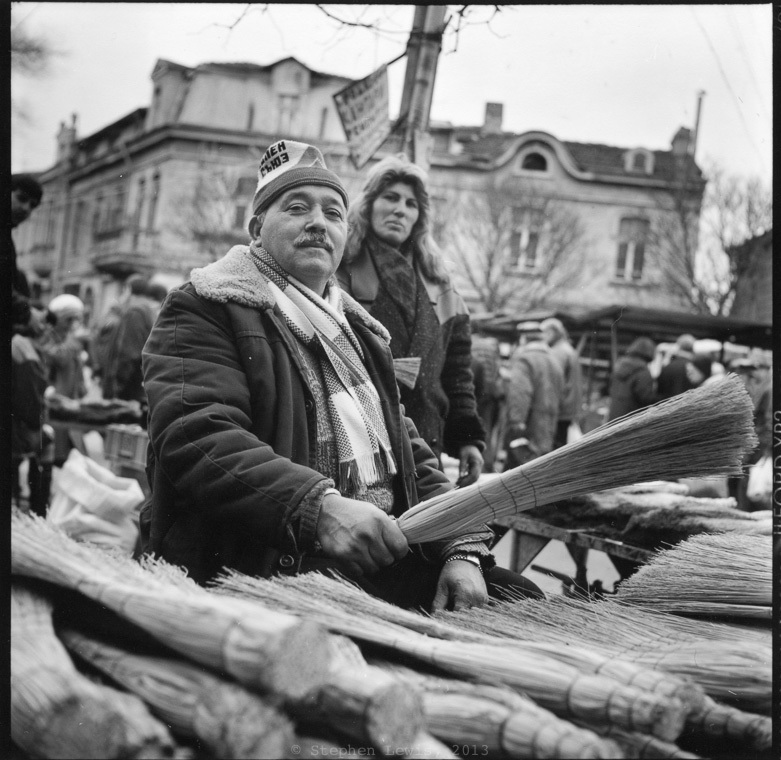 Roma broom sellers, Women’s Market, Sofia, Bulgaria, 1997. (Rolleiflex Tessar 𝘧3.5, Tri-X 400ASA, scan of print.) Click on image to enlarge. A good number of photographic sites I skim through on the internet betray an out-sized preoccupation with the virtues of fast, wide aperture lenses and their ability to create narrow planes of focus and patterns of background blur. As a counter to such, the photo above shows the virtues of slow, narrow-aperture lenses, in this case the 75mm Tessar f3.5, the built-in lens in a second-hand twin-lens Rolleiflex that I bought used more than three decades ago. The Tessar is one of the simplest designed and lightest weight lenses ever produced but when used properly it is second to none in sharpness, detail, and contrast. The Tessar’s 75mm focal length is a tad wider than 80mm, the usual “normal” focal length on 6x6cm medium-format film cameras. This 5mm difference enables the Tessar to deliver slightly wider coverage when used up-close, an advantage in environmental portraiture. The extra 5mm also provides a tad more depth of field and a slight exaggeration in perspective. The depth of field provided by the Tessar’s maximum aperture of f3.5 reduces the likeliness of focusing errors and keeps background details recognizable. In the photo above, thus, the main subject is in crisp focus while his wares and female colleague and the pedestrian traffic and architectural features of the market street behind him are sufficiently out of focus so as not to detract from the main subject but still clear enough to provide meaning and context. The Women’s Market — located on broad curved street, following the course of a one-time riverbed, just west of the present-day center of Sofia, Bulgaria — has a history that stretches back to the centuries when what is now Bulgaria was part of the Ottoman Empire. Following Bulgaria’s independence from Ottoman rule in the aftermath of the Russo-Turkish War of the 1870s, the Women’s Market was Sofia’s main retail produce outlet. Nearly a century later, during the final years of the communist period, the Women’s Market provided a buffer of private enterprise and a reliable source of seasonal produce. Following the collapse of the Soviet bloc in 1989, the Women’s Market remained a chief source of fresh fruit and vegetables in a city in which old distribution systems had collapsed and new ones had not yet formed. Over the last decade, however, the Market has been in a state of decline. Supermarkets and shopping malls have taken root throughout Sofia, tastes have changed, and those of the city’s inhabitants with disposable cash and pretensions to mobility have moved from the urban core to the urban periphery taking their purchasing power with them. In recent years, a large percentage of the Women’s Market’s street stalls have been removed by the municipality. At the moment, new modern multistory stall complexes wishfully described as being built for “tourists” and “artists” are under construction. What they will look like upon completion and the exact functions they will serve is anyone’s guess. What remains for now are rows of small enclosed kiosks selling local cheese, cured meats, and fish, plus scores of open fruit and vegetable stands under large brightly painted utilitarian canopies. Each stand is manned by vendors, some morose and silent, others vigorously or halfheartedly hawking their wares. In a lifetime of working in and observing cities in many places throughout the world, I’ve noticed that late-nineteenth century neighborhoods are amongst the last to be regenerated. This is due in part to the resilient endurance of their economic and social functions during the twentieth century and into the early-twenty-first. In such neighborhoods, cheap rents and high vacancy rates in storefront occupancy enabled the provision of inexpensive goods to those whose budgets constricted their choices. The same interstice of factors offers opportunities for marginal entrepreneurship and a shot at mobility to those who might otherwise fall outside of the economy. The low profit-margins inherent to such entrepreneurship, however, can also make for dubious goods and equally dubious practices. Thus, shopping in the Women’s Market calls for a taste for sharp-tongued banter and a quick eye ever on the lookout for rigged scales and for good looking produce on display but underweight and damaged goods placed in one’s shopping bag. Still, where else can one buy, for example, persimmons or grapes, albeit on the last legs of their shelf-lives, for a third of the price of elsewhere and serviceable tomatoes for even far less? There is a fine ethnic division of work and functions at the Women’s Market. Meat, cheese, and fish kiosks and stands offering wild herbs and mushrooms are run by ethnic Bulgarians. Fruit and vegetable stands and peripatetic bootleg cigarette operations are run by Roma (Gypsies). Storefronts in adjacent streets include honey and bee keeping supply stores run by Bulgarians and rows of “Arab” shops — halal butchers, spice stores, barbers, and low-cost international telephone services — run by and catering to increasing numbers of legal and illegal immigrants from Syria, Iraq, Palestine, Turkey, Central Asia, and Afghanistan. Many Bulgarians, their weak self esteem shakily bolstered by contempt for “others,” blame the shoddier commercial practices of this wonderfully vibrant marginal neighborhood on the presence and “inferiority” of such outsiders. Several years ago, I attended an open town meeting on the future of the Women’s Market and its surroundings. The meeting degenerated into hysterical, racist tirades against the presence and practices of Roma stand-holders and market laborers, this despite their being hardworking people trying to extract a semblance of a living from admittedly marginal trade and low-value added labor. Banish the Gypsies, the sense of the meeting implied, keep the neighborhood “white” and Christian, and the market area with magically become upscale and all will be well. Not a thought was given to viewing the attempts at entrepreneurship on the part of Roma as social and economic assets to be incubated, this whether out of commitment to equal opportunity or to the insights of developmental economists such as Albert O. Hirschman. The neighborhood’s “Arabs” were denounced with equal rage. Bulgarians complain that Roma do not work, but when Roma do work and commence to gain economic stability, the majority population reacts vengefully. Rage and blame have deep roots at the Women’s Market. On a symbolic level, blame even muddies the market’s name. During the communist period, the market had been renamed after Georgi Kirkov, an early Bulgarian left-wing trade unionist who died soon after the First World War. Following the collapse of Soviet-bloc communism, Kirkov’s name was expunged and Kirkov himself anachronistically assigned a share of blame for the mistakes and misdeeds of a neo-Stalist regime that came to power almost three decades after his death. Today, only a unkempt bust of Kirkov remains, mounted on graffiti-daubed pedestal in a small triangular park in which idle market day-laborers, elderly Roma mostly, congregate to smoke cigarettes, drink cheap alcohol from half-pint bottles, and while away the hours. There is another level of blame and contempt, however, that festers under the surface of debates pertaining to the Market. During the Second World War, the Bulgarian army rounded-up and deported to their death 18,000 Jews from Macedonia and northeastern Greece, areas ceded to Bulgaria by Nazi Germany in reward for favorable trade terms and a lion’s share of Bulgaria’s gold reserves. At the same time, within the boundaries of the Kingdom of Bulgaria proper, 50,000+ Jews were socially and economically disenfranchised and legally robbed of their real and movable property. Tens of thousands of Jews were deported from Sofia to the countryside; the younger and fitter male deportees were sent to work as slave laborers on road crews and the rest were left to fend for themselves without means of support in isolated villages. As a boon to ethnic Bulgarians living in Sofia, the deportation freed up hundreds of businesses (most of them marginal), thousands of dwellings in a city short of housing stock, and tens of thousands of places in the workforce. From the post-war period on, Bulgarians called the seizure of Jewish property and the deportation of Jews from Sofia “The Saving of the Jews,” giving a self-congratulatory spin to the large percentage of Jews in Bulgaria that came through the war alive, something that can be more accurately ascribed to Bulgaria’s being knocked out of the war by the Soviet Union in mid-1944. The reaction of more than 90% of the Jews in the Bulgaria to such a “saving,” was clear enough: emigrate en masse, mostly to Israel, not long after the war ended. Prior to the war, Sofia’s Jews had formed the bulk of the residents of the market quarter. Their deportation and post-war emigration created a vacuum in the midst of the city’s center and led to discontinuities and dislocations from which the streets surrounding the Women’s Market have yet to recover. Today, in a country almost without Jews, Jews remain an obsession for many Bulgarians and a target of their hostility and condescension. This especially holds true for populist agitators and amongst Bulgarians with higher incomes and social standing, whether real or self-ascribed. In such circles, Jews are blamed for communism and for capitalism and for imagined secret cabals that subvert Bulgaria and steer the world. The poisonous, fraudulent “Protocols of the Elders of Zion” remains a best-seller at outdoor book stalls in Sofia, as do conspiracy theory books involving Israel’s Mossad. Walls are daubed with antisemitic (and anti-Roma and anti-Turkish) slogans, the work of bands of neo-fascist football (soccer) supporters. Few social gatherings of upper-income or self-styledly cultured Bulgarians are complete without the telling of “yevreiski vitsovi” (“Jewish jokes”) — jokes about Jews rather than by them, usually with story lines about rich but stupid Jews outsmarting themselves in avaricious schemes. In truth, prior to the Second World War, most Jews in Bulgaria were marginal shopkeepers and low-income craftsmen, laborers, and peddlers. Like today’s Roma, Jews were blamed for the inherent defects of the economic niches in which they labored and the social niches in which they lived. Early in the twentieth century, many Sofia Jews were old-clothes and rag vendors, literally, thus, members of the “lumpenproletariat.” To this day, in Bulgaria, Jews — be they doctors, scholars, merchants, or ordinary folks like this writer — are contemptuously referred to as “chifuti,” a Bulgarian-language bastardization of the Turkish term “çıfıtcı” or old-clothes- and rag-seller. Personally, as someone who has worked for others since my 13th year, and whose roots are in a world not dissimilar to the that of the Women’s Market, I am quite willing to wear the label of “çıfıtcı“with pride. For this reason, when in Sofia, I happily continue to do my shopping in and around the Women’s Market and loyally patronize its Roma vendors … this regardless of any and all bruised and overripe fruit or real or imagined thumbs on scales! As to antisemitic, anti-Roma , anti-worker “cultured” Bulgarians, as we used to say in the Yiddish-English patois of my native Lower East Side of Manhattan: “Geh’n’d’r’ert!” (“Sink into the ground”). After years of listening to their racist hatefulness and class-condescension of , I’m always available to lend a helpful push. Stephen, dammit, I’m so glad I came across your writing again! Boyan. Am happy to have one of my favorite readers back! An email will follow these next days.